The Museum’s Moving Toys Gallery is divided into four sections – Pushes and Pulls, Springs and Cogs, Circuits and Motors and Look See. Moving toys range from rocking horses and pull-along toys to more complex clockwork and battery-operated toys. Optical toys are a kind of moving toy that creates visual special effects. We can learn a lot about science, design and technology from moving toys – the mechanisms include everything from cams and levers to the latest computer microchip. 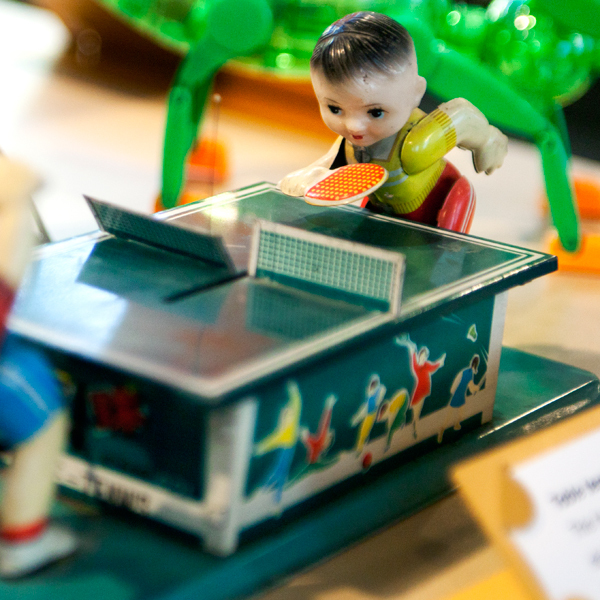 The Moving Toys Gallery has a wide variety of interactives for children to engage with, including rocking horses, Robbie the Robot, a train set, a peep show and zoetrope. Touchscreen interactives featuring moving toys games and quizzes are also situated throughout the gallery. Movie Camera, made from wood and engineering materials, uses a simple motor and electric circuit to dramatic effect. It has a movie camera on a tripod, which films a small carousel of dancing figures. The camera, which resembles a face, with the tripod as jointed legs, comes to life and starts to film the scene. Artist Peter Markey is fascinated by producing wave-like movements from wood. He uses simple, but effective mechanisms in his work, inspired by the motion of a see-saw. Pushes and Pulls looks at the toys that move by being pushed or pulled along by hand, by using a rocking, tilting or winding movement, with the aid of a string or by natural forces, such as gravity, magnets, wind or heat. There are hundreds of objects on display in Pushes and Pulls, including pedal cars and scooters, spinning tops, pull-along toy animals, rocking horses, puppets, toy theatres, and much more. Springs and Cogs showcases many different kinds of mechanical toys. 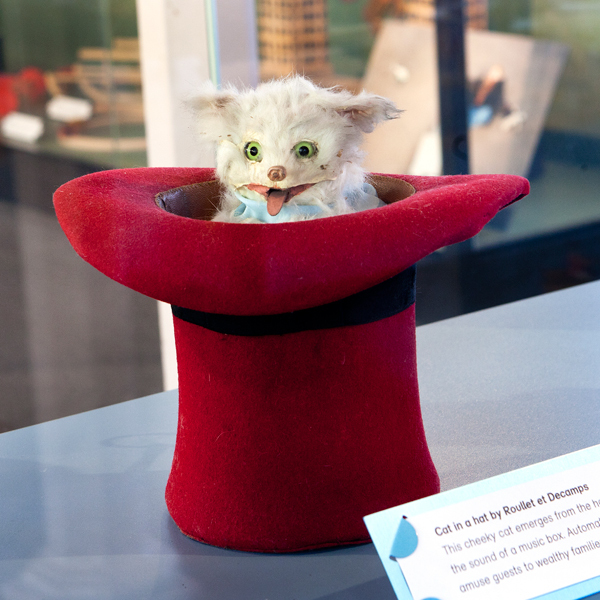 Objects on display include toys operated by a spring such as jack-in-the-boxes, clockwork toys dating from the mid-nineteenth century to the present day, friction toys including cars, aeroplanes and motorcycles, and much more. 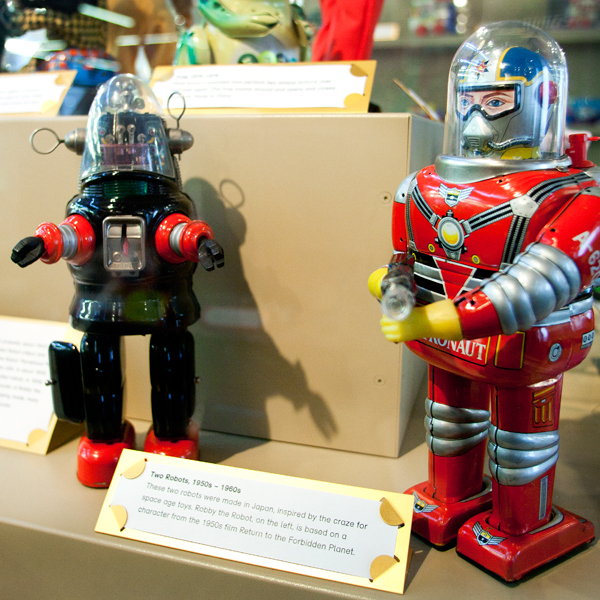 Circuits and Motors features many examples of toys powered by electricity, including battery-operated toys, and those operated by remote control. 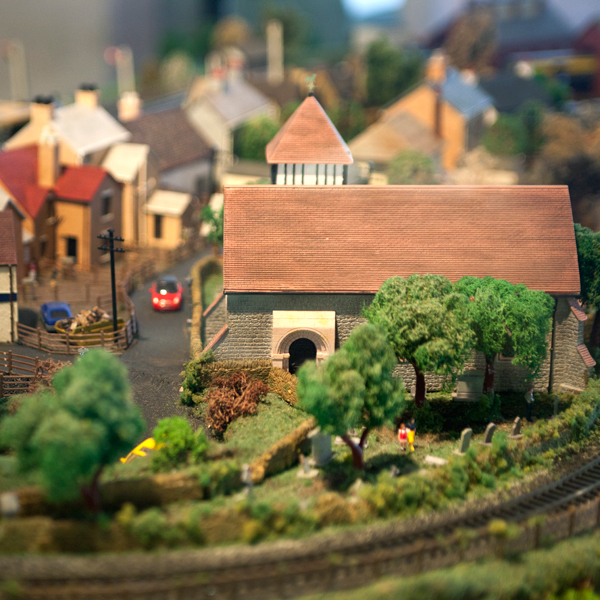 Objects on display include cars on tracks such as Scalextric (1964), remote control toys like Robosapien (2004) and electric train sets such as Hogwarts Express (2001). Look See takes a closer look at the many different kinds of toys that create special visual effects, either by making pictures move or by tricking the eyes into thinking they do. Look See includes objects that turn flat two dimensional images into 3-D (like the zogroscope, the stereoscope and the view-master), computer games, including hand-held and video game consoles such as the Game Boy and PlayStation, objects that project images such as magic lanterns, and those that make still images appear to move, like the zoetrope, thaumatrope and fantascope.